Ralph Lauren: Next Time, Olympic Uniforms Will Be 'Made In USA' : The Two-Way The Olympic committee and designer came under withering criticism for manufacturing the garments in China. 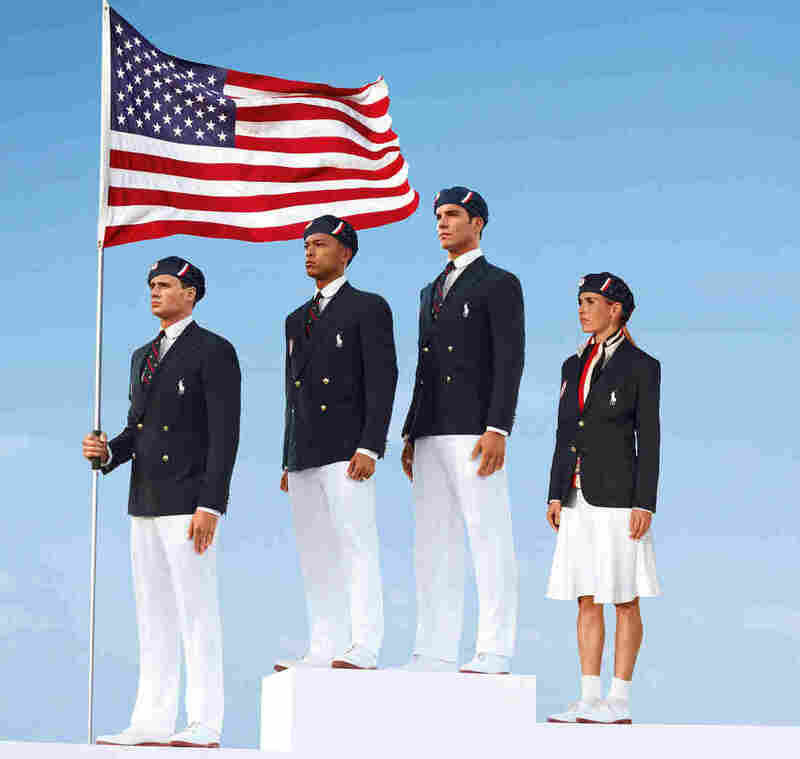 This product image released by Ralph Lauren shows U.S. Olympic athletes, from left, swimmer Ryan Lochte, decathlete Bryan Clay, rower Giuseppe Lanzone and soccer player Heather Mitts modeling the the official Team USA Opening Ceremony Parade Uniform. It was one of the few issues, both Republicans and Democrats in Congress agreed on: They were outraged that the uniforms to be worn by U.S. Olympic athletes at the London Summer Games were made in China. As we told you, Senate Majority Leader Harry Reid went so far as to say that the Olympic committee should "put [the uniforms] in a big pile and burn them." Reacting to the criticism, Ralph Lauren, the uniform's designer, said that for the next games — the 2014 Winter Games in Sochi, Russia — the uniforms will be made in the United States. "Ralph Lauren initially declined comment on the criticism, but 24 hours later announced clothes for future Olympics would be made in the United States," the AP reports. Saying they take the concerns of Congress and Americans "seriously," the United States Olympic Committee CEO Scott Blackmun said in a statement that it was too late to make the change for the upcoming summer games. "In the meantime, we ask for the American people's support. The members of Team USA have dedicated their entire lives to training for this one moment," Blackmun said. "They are some of the finest men and women this country has to offer and they are prepared to succeed both on and off the field of play in London. Our country should be proud of the individual athletes that will represent them in London and I'm hopeful that everyone will rally around Team USA."